A new model, accounting for knowledge gained from recent exoplenet discoveries (we've found more than 300 so far), predicts there's an Earth-like planet for every sun-type star in the galaxy. (CNN) That means there could by 100 billion options for us if we burn out the Earth. Kidding. Please, don't get your hopes up. We don't have any way of getting to any of the Earth-like planets that (may) exist. Using the fastest spacecraft we have now, it would take 100,000 years to reach the nearest star to our own Sun. Is there life on these planets? Almost certainly. But don't expect, you know, little green men. It's more likely we'd find a planet teaming with bacteria, or some other simple form of life. 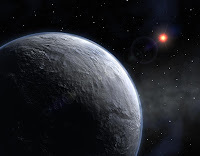 (Artist concept of rocky exoplanet OGLE-2005-BLG-390Lb by the ESO.